In spite of antiquities left by the Etruscans, Romans, ancient Greeks and others, Italy is one of the youngest countries in Europe; its republics, kingdoms, duchies and papal states were only united in 1870—hence the deeply-felt differences between Italy's regions in many aspects of daily life, from language to cuisine. This is the wealthiest third of the republic, the land of Alps and lakes, butter and cream, pasta all’uovo, polenta and risotti. For more detailed information on local specialities, scroll down the listings under each individual region's heading. Piedmont (Piemonte): Stretching from the Alps to table-flat rice paddies in the east, Piedmont is home to top wines (the famous three B's: Barolo, Barbera and Barbaresco), white truffles, cheeses (Castelmagno and Gorgonzola among many others) meats and hazelnuts, that reach their epiphany in gianduja: the town of Bra is headquarters of the Slow Food movement, while Turin hosts Slow Food's Salon del Gusto fairs. Among the best known Piedmontese specialities are bagna càuda, grissini, bollito misto, and finanziera. The name comes from the medieval Latin Pedemontium or Pedemontis, 'at the foot of the mountains'. Valle d’Aosta: Small, autonomous, bilingual (French and Italian) region in the highest Alps, especially renowned for its cheeses (Fontina, fondute), cured meats, and flaming coffee and booze shared in a grolla. The locals also speak Valdôtaina, a form of Occitan, resulting in some of the trickier names. The name means the 'Valleys of Augustus', by way of the Roman colony, Augusta Prætoria Salassorum (the modern city of Aosta). Liguria: The cuisine of Italy’s smallest region, Liguria (aka the Italian Riviera) in many ways is the much touted Mediterranean diet, classic cucina povera making good use of olive oil, fresh vegetables, pasta, seafood, a little cheese and wine. Classic dishes include cappon magro, focaccia, burrida, farinata and cima alla genovese. And of course Liguria also gave the world one of its favourite sauces: pesto. The name comes from the ancient Ligures, the tribe who occupied the region from the early first millennium BC. Lombardy (Lombardia): Large and dynamic region of Milan, the Po plain, the great alpine lakes and valley, the Valtellina, which claims a full sixth of Italy's population and produces much of the country's wealth. Lake fish such as lavarello are tasty, and hearty dishes prevail: polenta, cotoletta and risotto alla milanese, ossobuco and cassuoela. Among its many cheeses are Grano Padano. The Valtellina is famous for its buckwheat (grano saraceno) pizzoccheri. The name comes from the Lombards (or Longobardi), a Germanic tribe who occupied much of Italy in the 570s and made Pavia their capital. 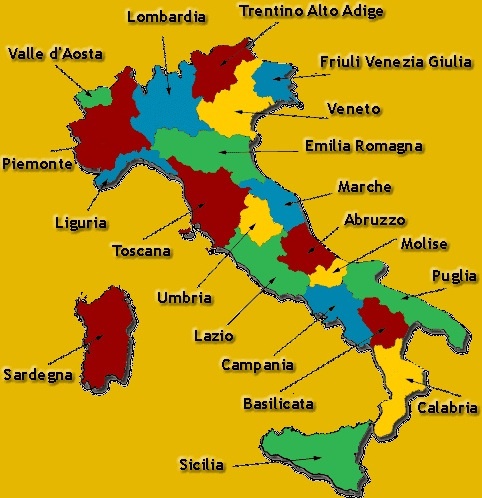 Veneto: This includes of course Venice itself, as well as the entroterra from the Po delta and lower Dolomites. Rich in seafood and shell fish from the Venetian lagoon and Chioggia, while growing radicchio, asparagus, and much more, the Veneto developed an original culinary style thanks to a thousand years of independence and influences from a vast Mediterranean trade network; classic dishes include risi e bisi, bigoli in salsa, gnocchi, and baccalà alla vicentina. The name comes from the Veneti, the ancient tribe inhabiting the region, who also gave the name to Venice. Trentino-Alto Adige (Süd Tirol): Encompassing the western Dolomites and bilingual Alto Adige on the Austrian border, Trentino is famous for apples, gnocchi and canederli; wine-making Alto Adige, not surprisingly has strong Austrian influences, with its strudels, smoked meats with rye bread, speck and Schlutzkrapfen. The name Trentino means the 'region of Trento' (the capital): Alto Adige comes from the upper valleys of the Adige River. Friuli-Venezia Giulia: Wedged in the corner between Austria and Slovenia, with a very complicated history and Trieste as its capital, this partly autonomous region is Italy with Central European twist and excellent white wines. There is superb ham from San Daniele di Friuli; further east await goulash, frico, jota, cjalzons, and wonderful desserts redolent of the Austro-Hungarian empire: gubana, strudels and more. The name Friuli is derived from the Roman foundation, Forum Iulii (Julius' Forum), the original name of the town, Cividale del Friuli. Venezia-Giulia refers to the area's former situation in the Venetian empire and the Julian Alps in the northeastern area of Carnia. Emilia-Romagna: Between north and central Italy, Emilia-Romagna neatly crosses the entire peninsula, occupying the Po plain and the northern Apennines. The locals say A panzu pina u s’ragiona mej–‘You think best with a full belly’, and are proud that their region rivals (if not trumps) Piedmont as home of Italy’s finest cuisine, with Bologna il Grasso ('the Fat') as capital. Emilia-Romagna has a well-deserved reputation for top quality pork, cheese and pasta, notably prosciutto di Parma, mortadella, tortellini, ragù alla bolognese and Parmigiana. Modena is world famous for its aceto balsamico, while the Romagna side is the source of piadine. The name Emilia, referring to the western half of the region, comes from the long straight Roman road, the Via Aemilia, constructed in 187 BC under the consul Marcus Aemilius Lepidus. Romagna is derived from Romània, the name given by the Lombards in the 6th century to the part of Italy still occupied by the Eastern Roman Empire (aka Byzantium), during the golden age of Ravenna. Here, for many, lies the archetypal Italy: rolling hills, faded ochre farmhouses and villas, cypresses, olive groves, hill towns, and the pines of Rome. For more detailed information on local specialities, scroll down the listings under each individual region's heading. Abruzzo: A rustic, undiscovered region, home of the Gran Sasso, the tallest of the Apennines and Abruzzo National Park. Good for game dishes, pecorino, saffron, and high-quality pasta: all'amatriciana sauce is from here, as are pizzelle, coglioni di mulo and the extraordinary beany virtú. The name comes from Aprutium, the Latin word for the region, probably derived from the Praetutii tribe who lived around modern Teramo. Lazio: This, Italy's third most populous, region includes Rome and a good deal more, although Rome hogs most of the attention. In spite of the capital's wealth and fame, la cucina romana is fairly simple: artichokes in various forms, hearty pasta dishes (fettuccini and pappardelle) and secondi that include offal dishes such as pajata and trippa alla romana as well as saltimbocca alla romana. It's especially good for snack foods, from supplì to porchetta to Roman-style pizza al taglio. The name comes from Latium, the land of the ancient Latin tribe who soon came to dominate the region—and the entire Mediterranean world. Marche (Marches): A region increasingly popular among visitors for its beautiful landscapes, Renaissance Urbino and other hill towns, good seafood from the coast and perhaps more than its share of unique specialities, including formaggio di fossa, olive ascolane, and vincisgrassi. The name is the plural form of marca, from the region's 9th-11th century political divisions after the conquest of Charlemagne (the Marca di Ancona, Marca di Camerino, and Marca di Fermo). Molise: With the highest villages in the Apennines, Molise is a small, very undiscovered corner of Italy, and its newest region (it formed part of Abruzzo until 1970). In the culinary arts, it still shares many of the same dishes, although the Molisani are perhaps even fonder of spicy diavolini, as in the region's lamb dish, capuzzelle e patane. The name is perhaps derived from the Latin mola, mill, or from the Norman lords, the Moulins, who ruled the region in the Middle Ages. Tuscany: A region that needs no introduction, but there’s more to it, however, than the enchanting art cities and landscapes, including excellent, simple food that Tuscans will tell you brings out the best in their excellent wines: bistecca alla fiorentina, arista and cacciucco from Livorno may be banner dishes, but also lots of fagioli, and cucina povera dishes such as pappa al pomodoro, acquacotta, ribollita and panzanella. The name is derived from Tuscia, the Latin word for the land of the Etruscans, who moved into the area in the latter part of the second millennium BC. Umbria: In many ways a more rustic version of Tuscany, spangled with historic hill towns such as Perugia, famous for chocolate: look for cirioli or strangozzi with porcini, black truffles or wild asparagus, game dishes (especially cinghiale), cured meats from the norcineria and pampepato. The name is derived from the Umbrii, the Italic tribe that inhabited the region in ancient times. The regions of Italy’s Mezzogiorno or south often seem an entirely different country from the green and tidy north. In the kitchen, dishes are often spicier, seasoned with capers, anchovies, lemon juice, oregano, olives and fennel, and the desserts sweeter and richer. For more detailed information on local specialities, scroll down the listings under each individual region's heading. Campania: This is the region of Naples and its famous bay including Pompeii, Vesuvius, Capri, Sorrento, Positano, Amalfi and Ravello. Naples itself, famous for pizza and animated italianità, is the best antidote to the decaffeinated control-freak Europe. Try spaghetti alle vongole, anything with mozzarella di buffala, and limoncello. The name derives from the Latin Campania felix, or 'Fertile Countryside'. Calabria: Once one of the most backward corners of Italy (being clobbered by earthquakes over the centuries, that have left it relatively bereft in the art and architecture departments) now struggling gamely to catch up. The source of the bergamot in your Earl Grey tea, the region has great seafood (alalunga, pesce spada, and the more unusual sardella). The Calabrese like it spicy hot; among the meats, it's best known for its pepper red 'njduja. The name Calabria comes either from the Greek kala ('beautiful' or 'good') or an Italic word for rock. In the 5th century AD it was the Byzantine name for the Salentine peninsula in Puglia, but the name 'migrated' west with the Byzantines when they were pushed westward by the Lombards; by the time the Normans occupied the toe of Italy in the 12th century, the name Calabria had stuck. Basilicata: Like its neighbour Calabria, the 'instep of Italy has suffered from earthquakes that destroyed the once-mighty Greek cities of the Ionian Coast; striking Matera with its cave dwellings is the prime destination for visitors, and home of the unusual pane di Matera. The region produces a wide range of sausages such as lucanica; you may even find some of the more rarefied dishes such as lampascioni. The name means 'imperial' (basilikos) and dates from the 6th century AD Byzantine conquest of the region. Puglia (Apulia): The heel of Italy is rich in culinary delights; the flat wheat fields of its Tavoliere are one of Italy's breadboxes, and it produces a lion's share of the country's olive oil. The seafood includes unusual shell fish such as fasolare and taiedda. Pugliese cooks make good use of vegetables and pulses; the classic pasta dishes are orecchiette con le cime di rapa and ciceri e tria. Also look out for the strongly flavoured ricotta forte. The name is derived from the Latin Apulia, meaning the 'land of Iapudes', the Italic tribe that inhabited the northern part of the region. Sicily (Sicilia): It's hard to know where to start with the big island, where ancient and Byzantine Greeks, Romans, Arabs, Normans and Spaniards have left behind culinary delights, with plenty of aubergines, olives, pine nuts, anchovies, and especially capers. Just to scratch the surface: pasta con le sarde or pasta alla Norma are popular starters; sweet-sour caponata goes with fish. The island makes great street food, from arancini to sfincione, and shows its sweet tooth in cassata, cannoli and frutti della martorana. The name is derived from the Sikels, one of the big island's ancient tribes. Sardinia (Sardegna): Nearly as big as Sicily, yet much further than the mainland, Sardinia over the centuries evolved its own language and cuisine. Traditionally an island of shepherds, it's famous for cheeses (including pecorino and the notorious larvae-filled casu axedu), lamb, suckling pig (porceddu) and exotic breads (notably the paper thin pane carasau and ornate pane delle feste. The name comes from sard, a pre-Roman word, perhaps linked to the island's native religion and its hero god, known in Latin as Sardus-Pater 'Father Sardus'.